Karl Gunter grew up as a mostly unsupervised farm boy in central Massachusetts, then spent 10 years working his way through various colleges. In 1978, he got a job as Exploration Geophysicist at Texaco Latin America, based in Coral Gables, Florida. Just a few years later he met and married Helena, a wonderful Colombian woman (“lil bird girl”) and they soon had 3 children. The Gunters worked & lived in Portugal, Angola, Ecuador, Colombia, Venezuela, then moved to Texas in 2000. When Karl wasn’t traveling the world for Chevron, his hobby consisted of building and racing his 220mph motorcycles. But after a 150mph crash in 2012, Helena finally put her little foot down on 2-wheeled racing. Karl’s racing obsession ended rather quickly, and was replaced by another hobby: WINE TASTING. Impact wrenches were slowly traded for bottle openers, and the furious roar of powerful engines replaced with the soothing sound of cork being popped. Sure, the rush of racing a bullet on wheels is hardly comparable to that of drinking wine. But on the plus side, Karl’s new hobby doesn’t require a helmet. In mid-2015, his empty shop started filling methodically with a collection of wine bottles… featuring animals. Coming late to the world of wine, Karl considers himself “wine-dumb but passionately curious”. He is now enthusiastically drinking and learning each day. What made you decide to start collecting bottles? This goofy wine bottle collection started in June 2015 when my wife asked me to pick up a bottle of merlot or malbec at our big supermarket. How hard can that be? Turned out, as a scotch drinker, it was almost impossible for me. I looked at a thousand bottles of red wine, stood there flummoxed, how to choose? 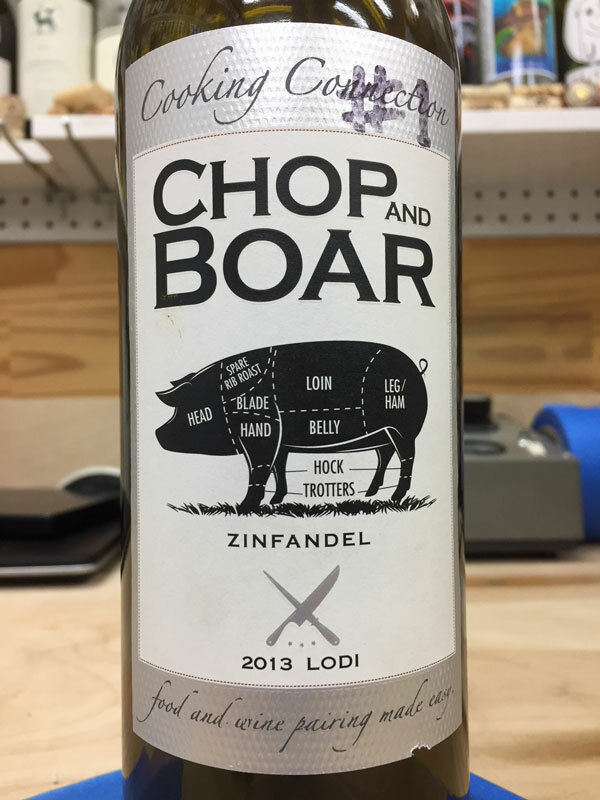 Then I saw a label with a pig, “Chop & Boar 2013 Zinfandel”. Ah-ha!!! Buy the pig! I laughed all the way home, told her about my wine selection technique, she also laughed. Told my friends, they laughed. Well, the joke was on me because now my garage is filling up with empty animal wine bottles, 1,204 as of this morning. Gotta be “wine” with an animal on the label. I have to participate in drinking from every bottle. Did you ever think your wine bottle collection would get to be so big? I never intended to start an animal wine bottle collection at all. But in mid-June 2015, a couple weeks after I started buying only animal wine, a friend Randy Bain, gave me a bottle with a shrimp & crab on it. It was so strange, I put it on the shelf in my garage. How do you organize your collection? Wine types? Animals? Chronologically? At first I put animals together, chickens & dogs predominated. Much later, I also started putting winery’s bottles together when they had a very similar theme, e.g. “Guyomas” / elephants, “Big Table Farms” / animal drawings, “The Fableist’s” / beautiful drawings. What is the percentage of bottles in your collection that you actually drank? Of the 1,205 bottles, I have participated in the drinking of 99.92% of them. The 2nd rule of the collection is: “I have to personally participate in drinking from every bottle”. 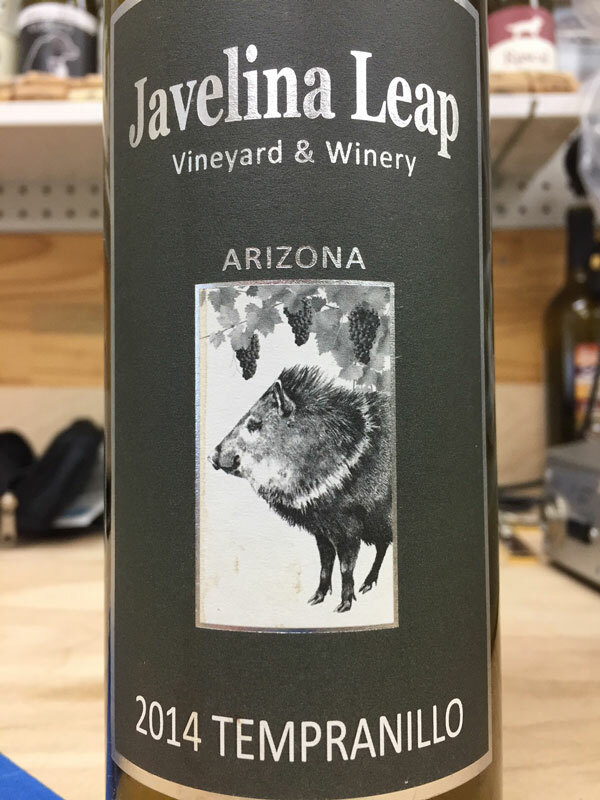 There is only one exception, a bottle of Arizona “Javelina Leap 2014 Tempranillo” which my Sister Paulie sent to me from Alaska, empty. It is the only javelina of our 50 pigs, I couldn’t find a full bottle anywhere. Tell me your favorite wine story that is in reference to one of these bottles. 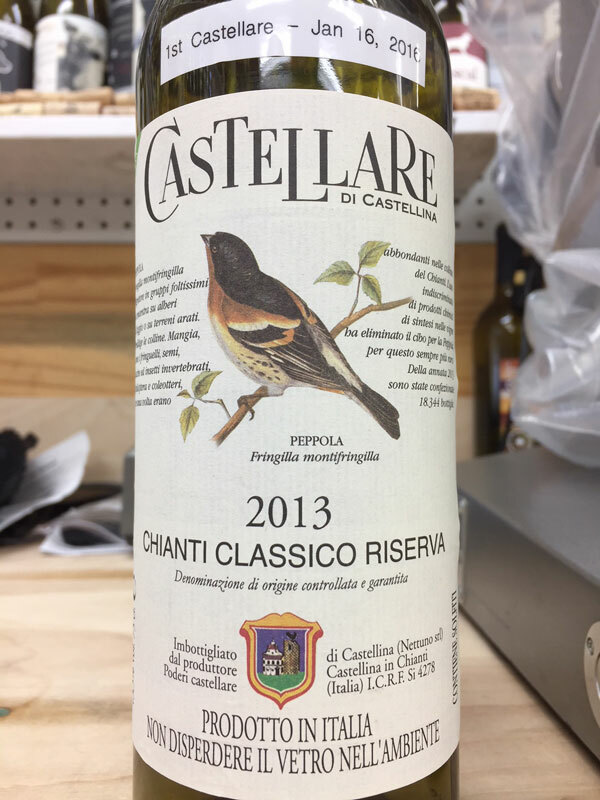 On January 16th 2016, I bought my 1st Castellare bird: “Castellare – 2013 Chianti Classico”. 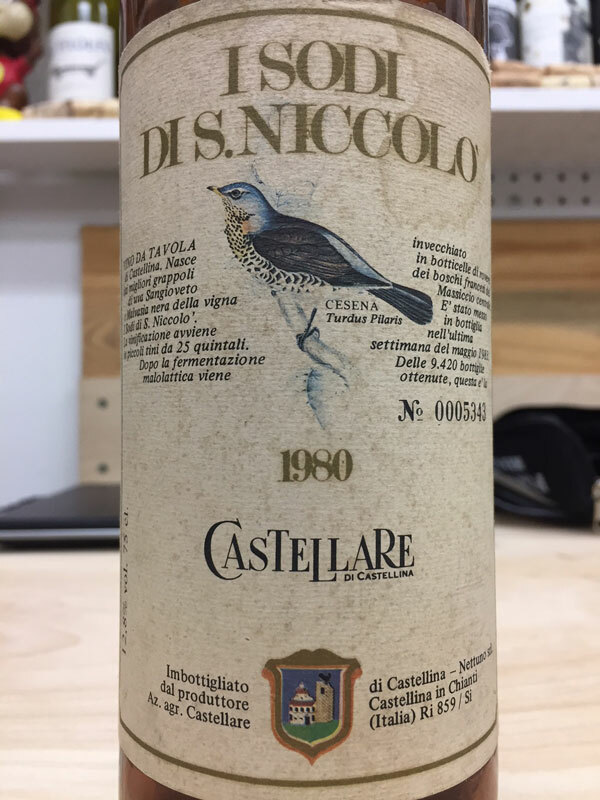 On January 22nd, my wife’s friend Vero gifted me a 2nd, I quickly became aware that every Castellare vintage has a different bird. In March, Silvia de Tomasi of Enoteca Oscar in Milan became my pal, found and shipped 9 Castellare vintages to me. The rest of 2016, I found 15 more Castellare birds, but still lacked 8. So I decided to go to Tuscany to find more. In April 2017, I went to Tuscany. Silvia’s father has a history with a VIP of Castellare, so she set us up to spend a night as guests at Rocca di Frassinello Winery, part of the Castellare wine biz. We got a personal tour and wine tasting, at 9am! Unfortunately we didn’t find any new Castellare birds, but did find their olive oil and vinegar. What’s the first bottle you saved in this collection? Lobster Cove 2010 Chardonnay (crab & shrimp) – In mid June 2015, a couple weeks after I started buying only animal wine, friends Randy and Susan Bain, gave me a bottle with a shrimp and crab on it, it was so strange I simply put it on the shelf in my garage. 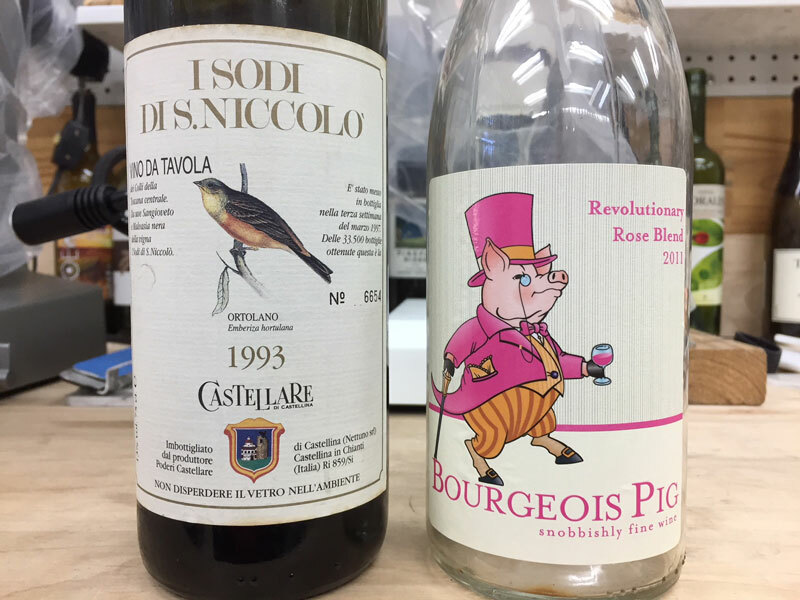 I then went back and re-bought the 1st animal wine, “Chop & Boar” we had consumed a couple weeks earlier, drank it and put it on the shelf as well. That bottle inadvertently started the animal wine bottle collection. What’s the oldest bottle in your wine bottle collection? What are the most and least prevalent animals from your collection? What’s the most interesting bottle in your collection and why? My “most interesting bottle”? 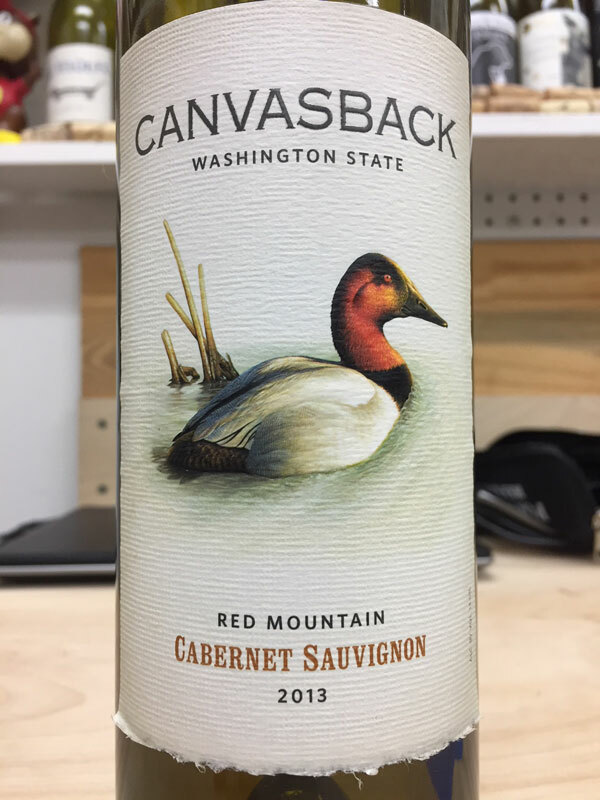 Hmmm… There are lots of ways to approach it, but I’ll say “Canvasback 2013 Cabernet Sauvignon”. It has a big, beautiful Canvasback duck painting, on a simple, nicely layed out label, and crème de la crème, the label is printed on paper with a canvas like texture. My wife Helena pointed out the texture to me because I missed it, being the “world’s least observant man”. What are the most and least expensive bottles? What’s the winery with the most amount of bottles in your collection? Castellare Di Castallina, Italy (38) – Each vintage has a different bird. Have you received any freebies from wineries? “Fruit of the Boot Rosé of Pinot Noir 2016” (monkey). The wine is from Massachusetts but the grapes are from California. Balderdash Winery owner Christian Hanson sent me that bottle after I told him what I was doing. Great guy! “Pelican Red NV”, South Carolina. Duplin Winery production manager Jason Bryan sent it free after I told him how hard it is to buy his wine. Great guy as well! Sidenote: I am working on getting a bottle of animal wine from every state; the only one I don’t have right now is Nevada. I have tasted 1,205 different wines since early June 2015, and I do not yet have a favorite. In fact I didn’t even start capturing my personal ratings until Dec 23, 2017. I took some classes, read a lot, but it seems my smoking interferes with my ability to taste and smell stuff that other people find easy. I do feel I am making progress albeit slowly. For two years, we have been having two bottles open every night, looking for similarities and differences. So I can say I like this better than that, but the next night is a new game. In a way, I hope I never find a favorite. Your wine bottle collection includes wine worldwide. Arguably speaking, do you have a favorite country in terms of wine? My favorite country outside of the USA is assuredly Italy only because we went there and I paid attention. I have had wine from 26 countries, and 49 states in the USA, but I am still so ignorant of the wine world it is truly pathetic. However, I am slowly learning bit and pieces. It is fascinating to witness the obsessive and positive passion of its practicioners. How many more bottles do you think you will add to this collection before it’s all over? Or – what happens when you run out of room? I really don’t have a target maximum, but could probably fit about 800 more into my garage. At the current rate of addition, that’ll be towards the end of 2019. 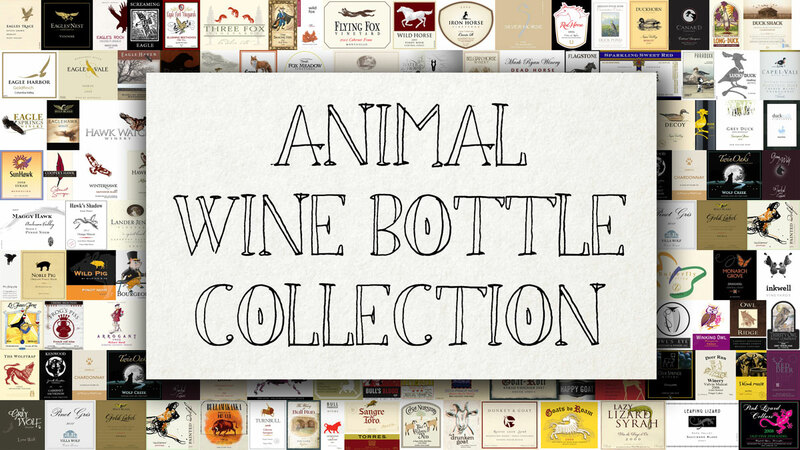 So if you want to help Karl grow his animal wine bottle collection, please send us a note, or comment at the bottom of this page. If you are a winemaker and you have a wine featuring some kind of animal on the label, send him a bottle or two! It’s for a good cause, and a good fellow. A whooping total of 1,208 bottles! This is GREAT. Excellent writing. Hilariously amazing collection. Thank you for the article. I am a Karl’s “followers”. It’s been fun and interesting. Karl researches the background of the label. Besides learning more about wine, I’ve learned lots more trivia. Your article is great and pulled together the wacky wierd story of Karl’s animal wine collection. Why am I not surprised?!? This caper is a delightfully quirky twist to wine appreciation. I would love a tour of the collection. You could charge admission: a bottle of wine with the appropriate label. Wow Betsy, you sure get around, one day you are supporting education in Georgia, another you are seeing the educational value in wine labels. Kudos to you! Karl is obviously a thirsty guy with great taste in wine, (one) woman and motorcycles. This is the holy trifecta of a modern renaissance man. I heard his other interest are pumpkin chunkin’ trebuchets, keeping up with a family of very successful kids and dreaming of ways to go ever-faster. He’s the ONLY one that I ever entrusted to ride my Ducati. Well done! 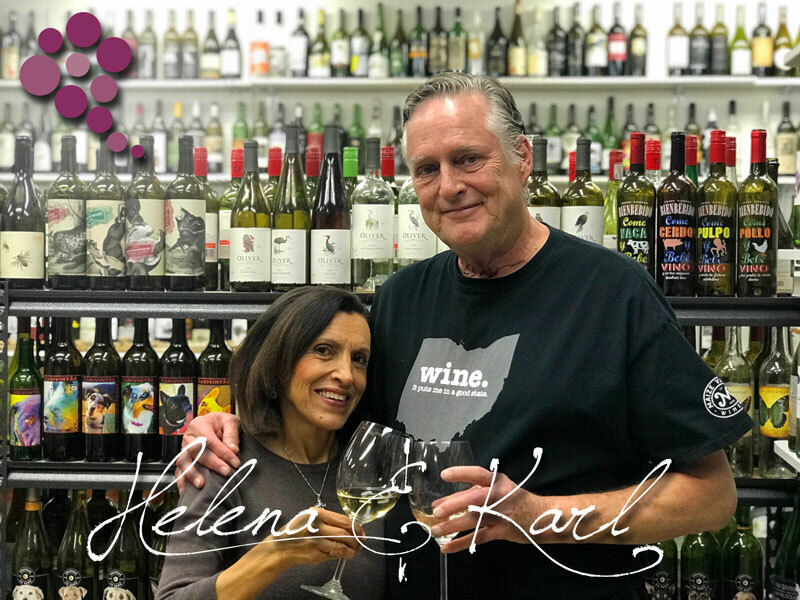 When Karl, Helena and his sister Paulie visited us a few years ago, we went to Paso Robles, CA to taste wine. We were too early for the tasting rooms so we headed to the local grocery stores and all of us helped Karl hunt for animal wine bottles talking the whole time over, through and around the aisles. It was hilarious and we got a few strange looks. Came back to our home between Monterey and Salinas, CA for a fun wine tasting and dinner. He shipped back to TX around 20+ bottles if I remember correctly! I’ll see if I can work on your Australian wines. Not sure if there is a blue-ringed octopus Riesling or a funnelweb sauvignon, but it would be a real treasure if there is. Australia has a ton of VERY cool animal wine labels!!!! Hell, it must be true, it’s written right there on the internet! For 2.5 years I have been actively looking for someone else who collects animal wine bottles, share tips n’ stuff but no luck yet. I’d be delighted to cede my title “largest in the world”, but first I hope to find “anyone else in the world” who has the same goofy hobby. Thanks much to Laurent, you are a Prince! As for the bold statement I’ve made, I am just waiting for anyone to prove me wrong! Think of it as bate ;) I do hope we find someone with the same or similar hobby. That would be icing on the cake! And who knows, this article might inspire people to start their own collection. Je suis également collectionneur, mais d’étiquettes de vins du monde. Ma collection regroupe environ 250,000 pièces à ce jour! Une collection qui prend de la place également! Parmi celle-ci de nombreuses étiquettes d’animaux… Peut-être pouvez-vous m’en trouver lors de vos visites dans les caves? Vous pouvez consulter mon site dédié aux étiquettes de vins du monde – http://www.bacchus13.fr – vous y trouverez mes coordonnées postales rubrique contacts. Bonne visite! N’hésitez pas à me contacter pour tout renseignements complémentaires! Amicalement de Provence en France! Bonjour Bruno! Et merci de nous rendre visite sur Wine Ponder. Je m’appelle Laurent et j’ai commencé Wine Ponder avec l’espoir de rassembler des personnes comme vous et Karl sur le net. Je souhaite que vous puissiez échanger quelques informations sur vos collections respectives. 250,000 étiquettes!!! Quelle collection! Félicitations et bonne continuation. Thanks much for the link to your site and the info on your collection. WOW!!! WOW!!! WOW!!! WOW!!! WOW!! !